Sprint carb to inlet manifold mounts are notorious for the rubber perishing and breaking away from the steel bonding causing air leaks and thus weak mixture. 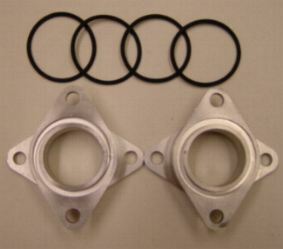 These alloy mounts are a direct replacement for the poorly designed rubber & steel bonded originals. If your rubber mounts are showing signs of perishing and cracking then chances are your engine is running weak. We have found the life expectancy of the rubber originals to be 2 - 4 years. These alloy mounts will last indefinitely.